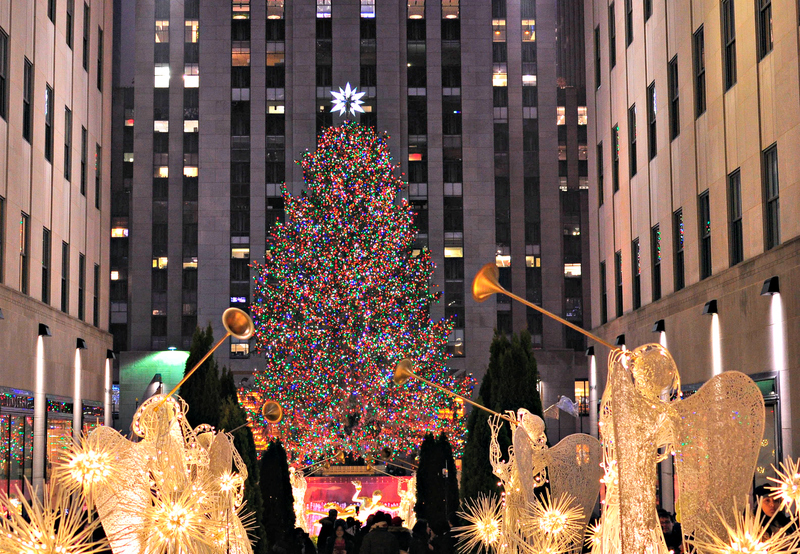 This past Christmas my mom and I decided to finally make our dream come true: Christmas at NEW YORK CITY! Due to organizational issues, we could only spend 5 days at it. This was a perfect reason to me to elaborate a detailed plan, almost by hours, not to miss any of the “musts”. So, here is my 5 days guide to get around NYC. Since we were short of time, we focused our trip in Manhattan. It is extremely easy to go around the island without getting lost; being that it is divided into parallels numbered streets and avenues. Don´t forget to check the weather before planning your visit. It could be very cold or very hot. We were exceptionally lucky, the weather was amazing when usually is very cold and windy. Also, plan your visits to the viewpoints depending on the sunrise/sunset hours. You can check the weather here. 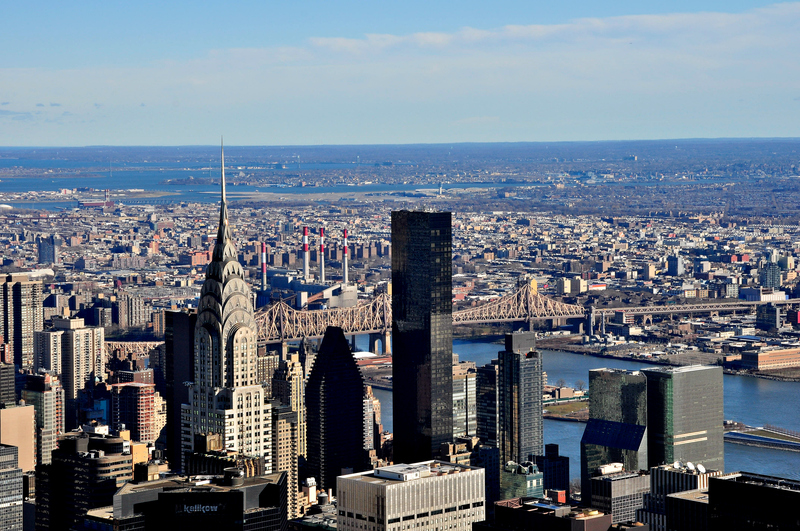 There is “The New York Pass” card that allows you to enter to most of the touristic sites without having to buy each ticket separately. Check its web to see if it is profitable for you. We didn’t buy it. Don´t forget that the rate of tips in U.S.A is between 15-20%. Usually, it is well deserved. Also, free wifi is almost available at every place you go. 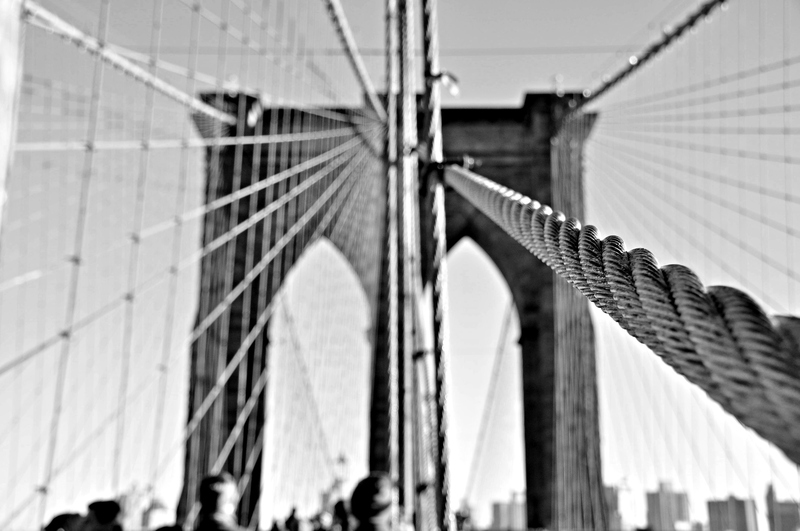 Brooklyn Bridge. It is beautiful. My recommendation is to cross it, or at least go halfway, walking. It is too crowded to go cycling. Central Park, with the Wollman ice skating ring, the Strawberry Fields (memorial to John Lennon), The Alice in Wonderland sculpture, among other things. Check its web for events. Grand Central Terminal, the largest station in the world by number of platforms, and also very popular in movies. Fao Schwarz, with its popular floor piano it is a dream to every child and adult. Walk around the Flatiron Building, one of the first’s skyscrapers in NYC. 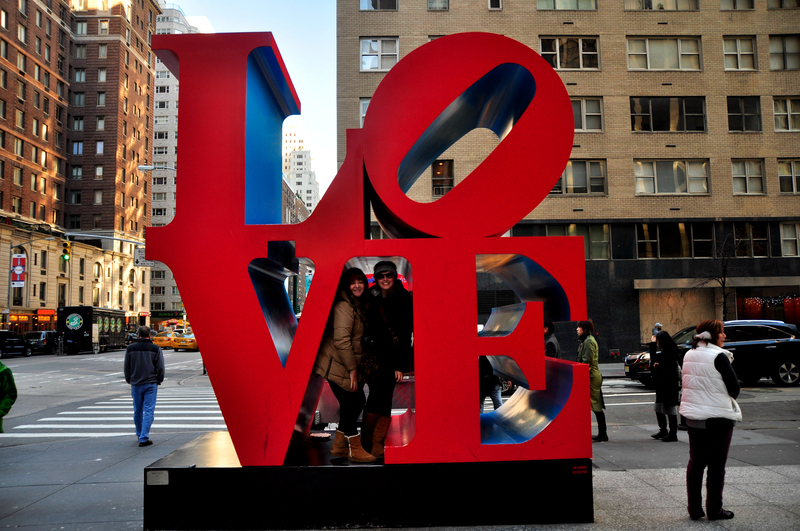 LOVE iconic sculpture of Robert Indiana. The original image served as Museum of Modern Art (MoMA) Christmas card in 1964. Ferry to Staten Island. A free way to get nice shots of the Statue of Liberty and also walk around the Staten Island. Walk around the One World Trade Center. 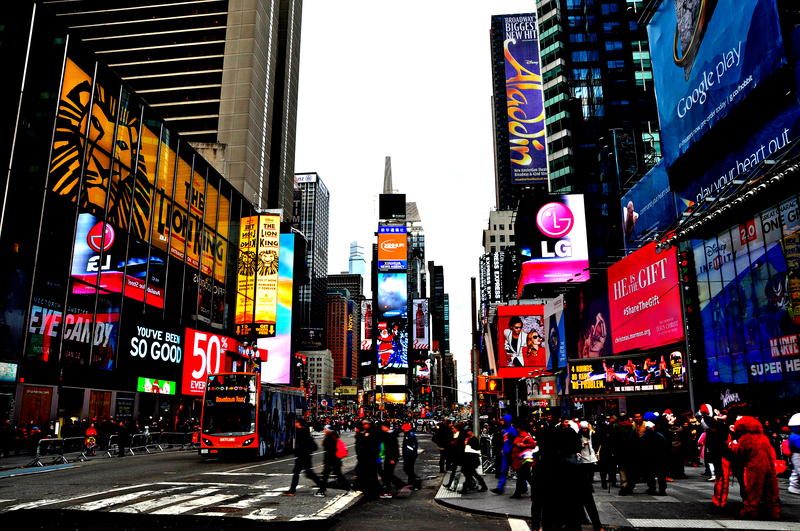 Time Square, a major commercial intersection that I would recommend to visit during the sunset to get nice shots. If you have time visit the Hershey´s and M&M store, they are close by. Rockefeller Center. You will feel like in a movie just by walking through. St. Patrick´s Cathedral. Beautiful church close to Rockefeller Center. MET. Amazing museum. Careful, admission is free but it is not clear at their web site. I ended up giving a donation (25$) thinking it was the entry. Little Italy and SoHo. Perfect to spend a couple of hours admiring particular shops at SoHo, closing with a nice dinner at Little Italy. These two neighborhoods are right next to each other. Statue of Liberty. 28$ with Crown access. 25$ with Pedestal access. 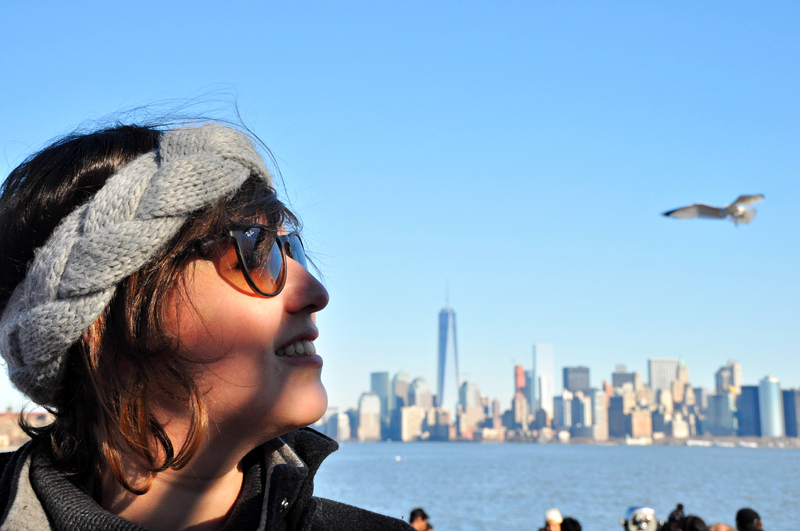 Both tickets include the ferry to Liberty and Ellis islands. I bought the pedestal access since the Crown tickets were sold out, but we were satisfied. Remember you have the free option to take the ferry to Staten Island, that doesn’t stop at the Liberty Island, but you pass close to it. Empire State Building. Amazing experience. You can access to the 86th (29$) and 102th (46$) floors. We bought the tickets with express pass, totally worth it (50$ and 67$, respectively). The difference between the 2 floors is not that much since you are already really high. Top of the Rock (30 Rock) at Rockefeller Center. Stunning view of the entire city. Try to go at sunset hours. We booked our tickets (29$) with plenty of time but it turned out that it was a cloudy day; they kindly suggested us to change ours tickets for the next day, really nice of them. Purchase a timed ticket to avoid lines. MoMA. Another must. Just the museum itself is beautiful. You have the option to download its app with the audio guide. American Museum of Natural History. We didn´t have enough time to go, but I heard it is impressive. 911 Memorial (Ground Zero). The World Trade Center after the September 11 attacks. 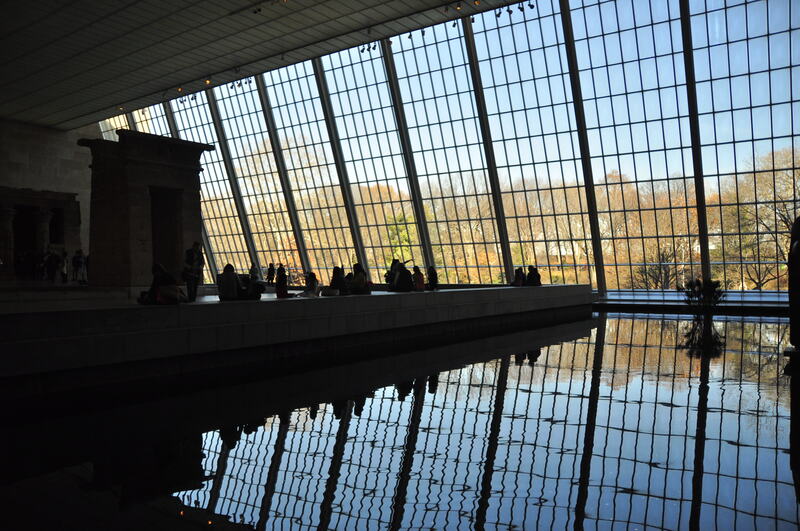 There is a memorial and a museum. Particularly, we didn’t visit this site to avoid remembering that tragedy. Anyway, the 911 Memorial is an open plaza, free to the public, and the museum cost 24$. Go to a Broadway show. We went to the classic “The Phantom of the Opera”. Check the Broadway web to buy tickets. I also heard that “The Book of Mormon” is quite amazing and I loved “Wicked” when I saw it in London. 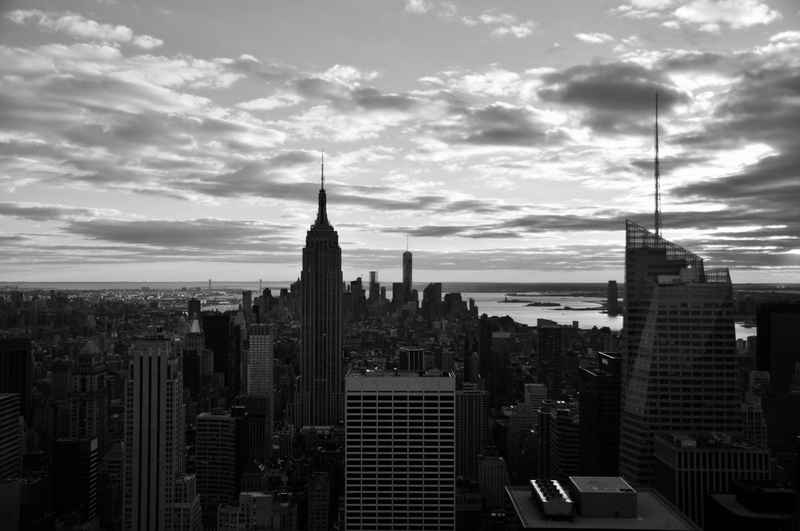 230 Fifth. Rooftop Lounge. Gorgeous view. 5th Avenue, between 26th and 27th Street. Shake Schack. A typical burger place that you can find around the city. 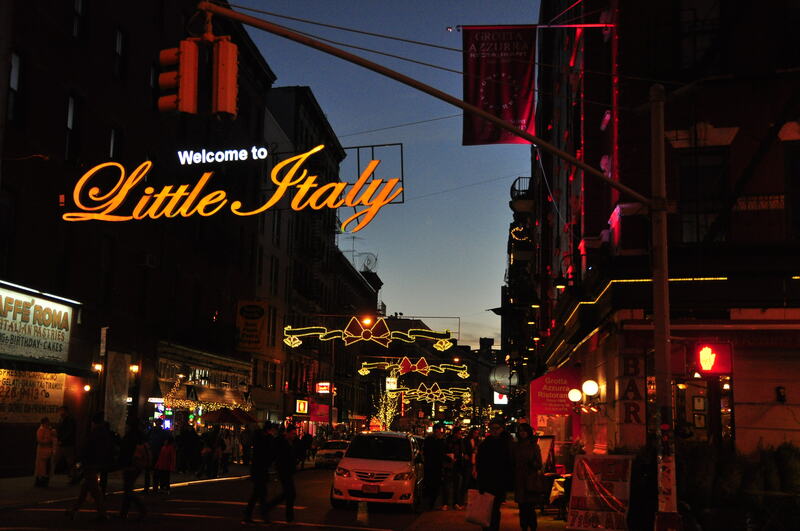 Little Italy. You can find a lot of sensational Italian restaurants around this neighborhood, with accessible prices. The View, at the Marriott Hotel. A little out of budget, but really good for an especial occasion. Broadway Avenue, between 45th and 46th Street. EATALY. At 23rd Street, between 5th and 6th Avenue, by the Flatiron Building… I so want to live in NYC just to go to this place every week. Sarabeth´s for a lovely brunch. 59th Street, between 5th and 6th Avenue (close to Central Park). We allowed ourselves a little luxury by staying at the Hilton Garden Inn, Central Park South, in Manhattan. At 54th Street, between 7th and 8th Avenue. Take into account that NYC is very expensive, including the subway/train tickets. Plus, we were short of time. By staying at this hotel, we were able to walk almost everywhere, which to me is the best way to feel the city. We end up paying 1080$ per 4 nights. If you are more than 2, maybe is a good option to rent an apartment. Taxi from JFK Airport to Manhattan: Flat Fare of 52$ (excluding tolls and tips). Taxi from La Guardia Airport to Manhattan: 29-37$ (excluding tolls and tips). MET. 5th Avenue with 82nd Street. Central Park. You have an access right next to the MET. Fao Schwarz. 5th Avenue with 58th Street. LOVE sculpture. 6th Avenue with 55th Street. MoMA. 53rd Street, between 5th and 6th Avenue. St. Patrick´s Cathedral. 5th Avenue, between 50th and 51st Street. Top of the Rock (at Rockefeller Center). Book at sunset. 5th Avenue, between 49th and 50th Street. Time Square (go also to M&M and Hershey’s store). Bryant Park. 5th Avenue with 40th Street. Grand Central Terminal. Park Avenue with 42nd Street. Empire State Building. 5th Avenue, between 33rd and 34th Street. Flatiron Building. 5th Avenue with 23rd Street. EATALY. 23rd street, between 5th and 6th Avenue. Statue of Liberty. 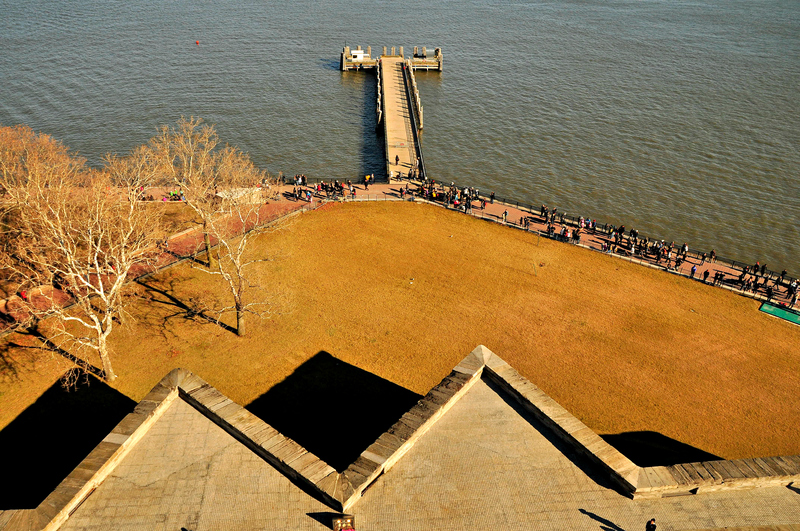 Go to South Ferry Loop station to catch the ferry to Liberty Island. 911 Memorial. Ground Zero. Wall Street. Walk around Little Italy and SoHo. There is a free walking tour around SoHo, Little Italy and Chinatown that you can check here. I try to leave the last day out of schedule in case I had an unexpected change of plans during the previous days and I need some extra time to visit my “musts”. Yankees Stadium (At the Bronx). Remember you are on holidays and nothing happen if you have to get a little bit off schedule. Try not only to take pictures, but enjoy every moment of your trip, stop at unexpected places you see around and if you miss something, it will always be a good reason to go back there in the future. Thanks for the nice comments! Im really glad you found it useful.